The GFZ owned fluid sampler sonde is of positive displacement type (PDS) which allows for a very controlled sampling procedure without any sudden decompression and hence degassing. It can take one sample (0.6 liter) at a time. It can be combined with the OSG slimhole mud parameter sonde for an accurate positioning in the flow zone. 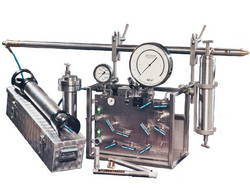 The fluid sampler is available as service only, i.e. operated by experienced GFZ personnel. It is available with standard OSG downhole logging service conditions.